Get the most out of your selectorized strength training with Cybex Eagle NX and Prestige VRS videos, tips, and more. 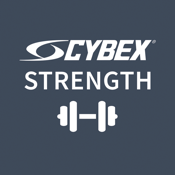 This app is brought to you by Cybex, the leading fitness manufacturer of premium strength and cardio exercise equipment. Instructional videos guide exercisers and personal trainers through the proper set-up and standard movements for over 35 strength machines. The Cybex machines are pieces are designed to target key muscles in upper, lower body and torso. The Eagle NX section also features advanced movement videos that are provided to enable all level of exercisers to benefit from the progressive training options afforded on the equipment. Other features include fitness tips and links to Cybex’s cardio products such as the Arc Trainer to further assist exercisers with achieving their fitness goals.